Flying to Morzine with your bike? Packing up your bike for that mountain bike holiday in Morzine or Finale Ligure with your mate is the best feeling there is, apart from smashing the trail up when you arrive. But how much does it really cost to take your bike on the plane and what do individual providers really charge you for the pleasure. Our friends over at YellowJersey have put together this funky infographic to show you what the deal is with out having to search through ever Website, enjoy! 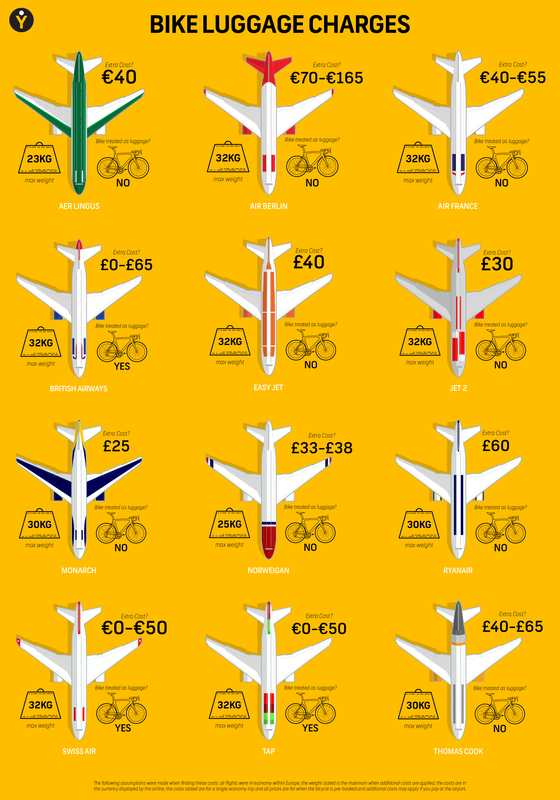 Every airline will offer something different, some include the bicycle as hold luggage some don't, with some airlines your ticket will cost more and the bike is free and others the ticket is less and the bike £70 like Easyjet. It's a mine field out there but if you look hard enough at the T&C's you will find what you're after. Easyjet recently reduced their bike bag weight allowance down to 25kg and there was uproar, it soon went back to the 32kg weight we know and expect, well done. Fly with BA however and it's a free cheese and pickle sanger and free bike carriage but costs a little more.